When you start to eat in a cleaner, more whole-foods focused way you need new cooking inspiration. 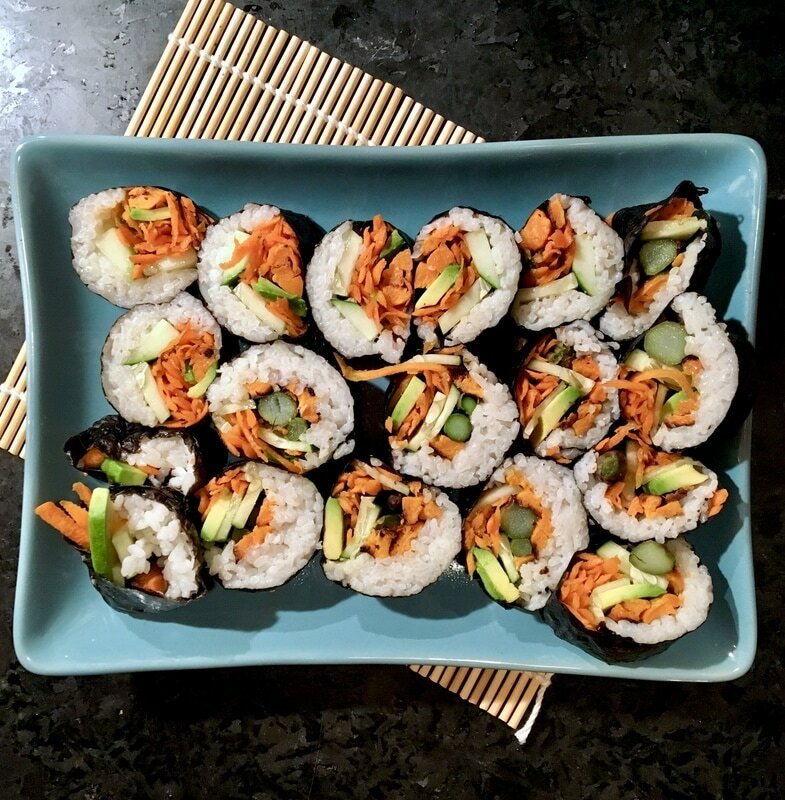 One of my favorite ways to bring in delicious veggies, especially during the spring and summer, is veggie sushi rolls. Sushi rolling always intimidated me, but after I did it once, it was so easy, so fun, and so delicious - I haven't looked back. I use an organic sticky rice, and organic sushi nori for wrapping. The rolling is really pretty easy once you've made a hand-full of ugly rolls. I'm no pro, but my rolls stay together and make up in deliciousness, what they lack in aesthetics. Just like with my tacos, I'm a notorious over-stuffer, but hey - it's all good veggie stuff, and I can still get them closed. Here's a quick how-to video about rolling. I like to use a bamboo mat when I roll sushi, as I find it helps keep my rolls together and more uniformly rolled. While some people wrap their bamboo mats in plastic wrap, I haven't found a need. I serve my veggie rolls with pickled ginger, wasabi, and Bragg's Liquid Aminos. These make a great spring and summer lunch or dinner. They're light but filling, and I can rotate the vegetables according to what's in season or on-hand. I'd love to hear about your sushi rolling adventures. What are your favorite ingredients? Happy rolling!